Hawkes’ patented Festoon pattern of 1897 (patent no. 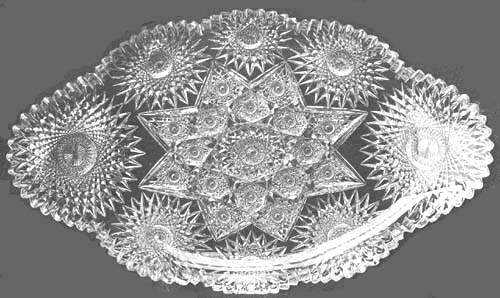 26,731) is sometimes misidentified because the pattern is similar to International Silver’s Star pattern, a somewhat later pattern that was cut by the Meriden Cut Glass Company. Confusingly, in the books by Bill and Louise Boggess this Star pattern is consistently identified as Hawkes’ Festoon, while Festoon is mistaken for International Silver’s Star! The drawing that accompanies Hawkes’ patent is shown on the right. 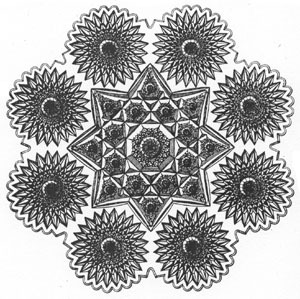 Below is an example of the Festoon pattern as cut on a large ice-cream tray, shape no. 1056. The image is taken from the ACGA’s composite Hawkes catalog which was published in 1989. (The photograph neatly captures a reflection that confirms that a plain [i.e., non-figured] blank has been used, as is always the case with Hawkes.) The tray’s dimensions are shown in Spillman (1996, p. 122) — L = 17.5″ (44.4 cm) and W = 10.5″ (26.7 cm) — where the author incorrectly describes the item as a bowl. Hawkes obtained the blank for this ice-cream tray from the Libbey Glass Company. There it was known as shape no. 285. The Hawkes company also produced an alternate version of the Festoon pattern — which it also named Festoon — that differs significantly from the patent. 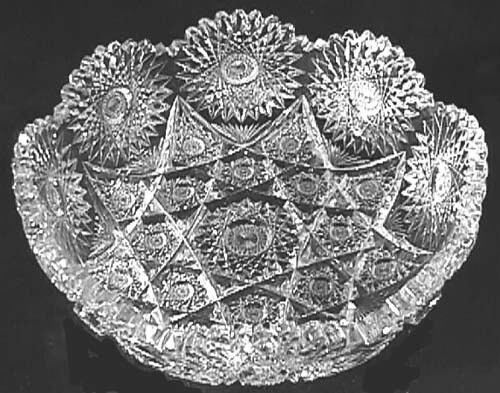 An example of this version, on a bowl, shape no. 700, is shown below (Image: Internet). Here Hawkes drops the single mitering that outlines the large, central star figure on the patent and adds interior fans. Although this version is shown in Sinclaire and Spillman (1997, p. 84), a better-quality print is available in the HAWKES PHOTOGRAPHIC FOLIO (c1897) published by the ACGA in 2003. At the present time collectors make little distinction between the two Hawkes patterns, and they call both of them Festoon. A 7″D plate in the patented version sold for $810 at an eBay auction in 2002. This unusual pattern has been known to collectors since at least 1969 when it appeared in the Pearsons’ book A STUDY OF AMERICAN CUT GLASS COLLECTIONS (p. 180). The present example is a near-duplicate of the tray illustrated in that book, and it uses an identical blank. Note the use of edge- (or slice-) cutting to define the clover’s leaves. 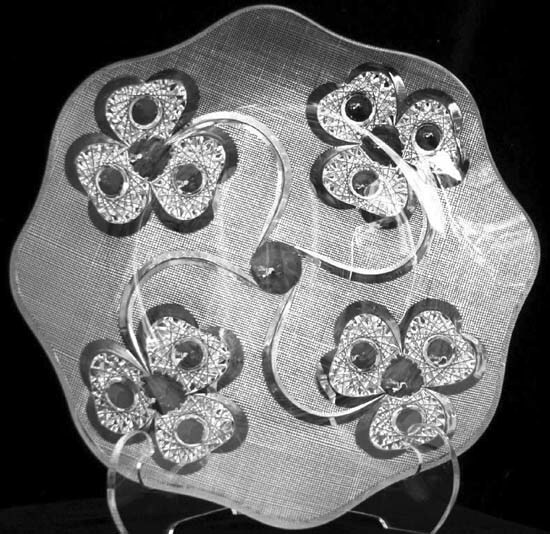 A tray or plate with a diameter of 14″ (35.6 cm); weight 6 lb (2.7 kg); signed Hawkes. This tray sold for $4,550 at an eBay auction in 2004 (Images: Internet). At the time the Pearson book was published the tray illustrated there was owned by a collector named Larson of Clayton, MO. The tray’s whereabouts today is unknown. There are only very slight differences between the two trays. For example, the cross-hatching on the Larson tray makes an acute angle; here the two directions are normal to each other. To the writer this latter arrangement, in particular, suggests that this motif was intended to represent the weave of a table cloth made of linen, an acknowledgment of this Irish industry of bygone years. But this may, of course, be a coincidence. The Larson tray is probably unique because, according to the Pearsons, it is signed by both Hawkes and the glass cutter. Presumably the Hawkes “signature” is the familiar acid-etched trademark. Unfortunately, no further information is provided — the Pearsons even fail to mention the cutter’s name! In spite of the extensive data base of pattern names in the Hawkes catalog the name of this pattern has not yet been discovered. 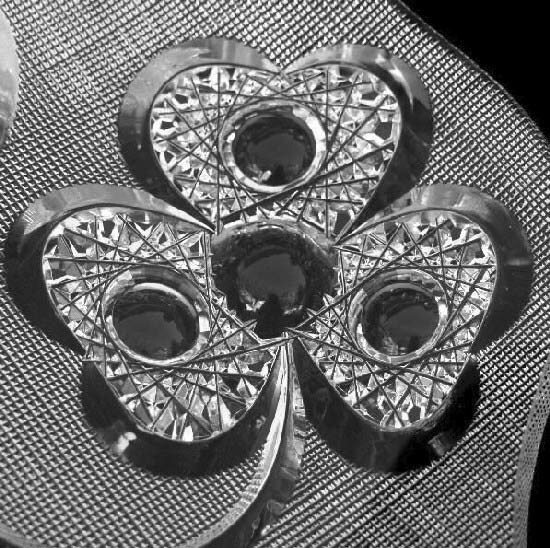 The Pearsons seem to imply that it is they who have introduced the name “Clover”, and that this is not the official name of the pattern. Although it is usually known by this name, some collectors refer to the pattern as “Shamrock”. This name is probably even more appropriate because “shamrock” is derived from the Irish word for clover (seamróg), and, as the national emblem of Ireland, it honors T. G. Hawkes’ birthplace. It will be interesting to learn what the Hawkes company actually called this unusual and striking pattern. 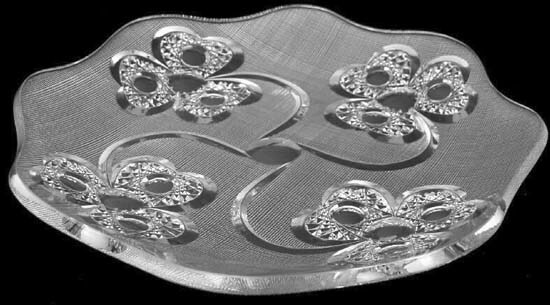 One can speculate as to the existence of this pattern on other articles, but it is likely that it was designed for use on trays and plates exclusively.